The St. Margaret’s School Archives is seeking NEW volunteers. The Archives is open Wednesdays from 9:30 am to 3:30 pm. The volunteers usually come between 9:30 am and noon. We are looking for volunteers available for variety of time commitments from once-a week (Sept to June) to assist with research requests and photo identification; short term (weekly for 3-4 weeks to assist with class projects); OR once or twice a year (old girls weekend / alumna event archives open house or class visits). Some work may be done at home (notifying Archives of news / obituaries of alumna or being available to contact to assist in solving tricky research questions). We are appreciate whatever you are able to volunteer. Your knowledge may hold the answer to solving our puzzle. Volunteers are given a project that matches their skills and interests. Training on archive procedures is provided. Knowledge of the school and its former students and staff is helpful in photo identification. • The Archives does historical research on school events, traditions, clubs/teams, buildings, etc. • We research biographical information on former students and staff (family history, genealogy). 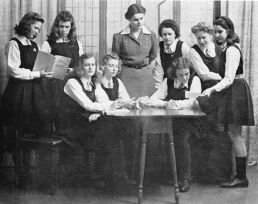 • We compile information and lists on the school’s trophy collection, uniforms, students councils, prefects, board of governors, staff and student, alumna who did war service during World War II, etc. (using Excel and Word). • We create displays for the bulletin board in the Learning Commons (Library) and the display case in the Junior School multi-purpose room as well as temporary displays for alumna events. • We assist teachers with visits to the Archives and class projects using the Archives collection as well as invite alumna to visit the Archives during alumna events. We are currently looking for volunteers interested in completing our trophy inventory that the late Margaret Smith had almost completed before her death and to proofread the transcriptions against the original trophies. Margaret was transcribing the inscriptions on the trophies including the recipients names and adding any additional information about the trophy’s history. If you are interested in volunteering in the St. Margaret’s School Archives, contact the Archives or leave a voicemail message at 250-479-7171 ext. 2382.